Realizing the current legal and economic limitations, we have democratically decided to register Coopon SciTech, as LLP firm, under Ministry of Corporate Affairs, India. We desire to operate with Cooperative principles, with a Free Software and Hardware Ethos, making us a Worker Owned Cooperative, in particular a operational cooperative. Firm Deed - common rules, protocols - for legal requirement. Quantification of Skill & Experience. Quantification of Remuneration derived from overall Revenue of Coopon. System for Project Management: Client requirements dictate the number of tasks and features a project required to complete. A system to help track and manage tasks, commits, contributed work hours, all focused towards managing projects that a member contributing for. It is a social strategy where completion of tasks/features/issues/tickets needs account of - finally to derive how much a contributing member has worked for ? Depending upon the complexity, skill and experience, completion rate varies, and thus number of working hours varies. 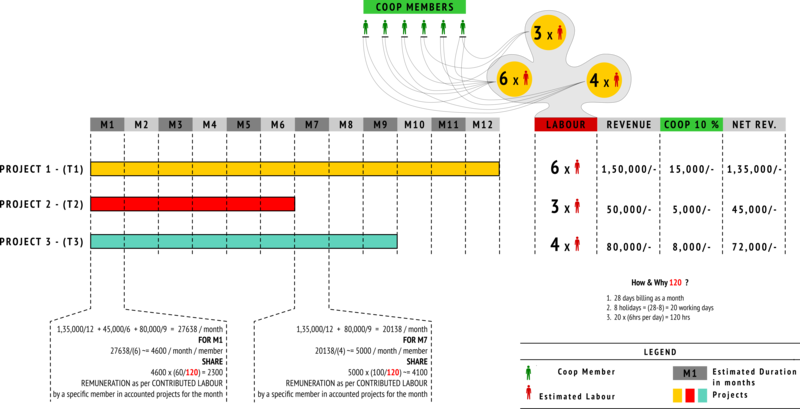 This not only help quantify how much a member contributes for a particular project, but also how one must manage the total optimum/reference working hours for the cooperative. We have decided to use Gitlab cycle management system for it. System for Calculating Remuneration: From the project management system we shall derive how much a member contributes for a particular project from the available 120hr reference working hours for the cooperative. If one finishes early depending upon the skill and experience, the remaining hours shall be used to contribute to some other tasks/issues or might be spent for skilling themselves again through contribution (active learning). This is an accounting process where we have to address equality not limited to coopon ownership, but also in remuneration - until we reach a stage where each of us get a decent financial sustenance to support us and our families - reality. System to self assess skill and knowledge: While actively contributing and earning entitled remuneration, with measurement and feedback, one also gains skill, experience and knowledge of how cooperative is functioning and what one needs to know, share, learn, practice for cooperative to sustain and walk on its vision, goals and dreams. Thus working makes us learn, and it needs a periodic self assessment in qualitative and quantitative means from each member of coopon. Having transparency in this, will also allows other to see to others know. Thus through this we can able to answer : known knowns, known unknowns, unknown knowns. This will also give us confidence at individual member level to assess our collective skill and confidence, courage to work on flagship projects, take on new, challenging and projects that align to our principles. For now we are using wiki, to address skills associated with project particulars as well as skills as a collective too. The strategy illustrated above not only allows us to normalize revenue based on projects, duration and labour. This reinforces, that any particular member is not isolated and always has influence in collective sustenance, which in turn will influence their sustenance. This will eradicate/minimize the incentive/greed for any member to freeload or think selfishly, while also act in favour to generate more mutual benefit or revenue - by participating in self managing and organizing, allowing them to practice principles of cooperativism in reality, by uphelding transparency. We like to self finance ourself through some exvestment strategy. However we are also open for collaborative funding, crowd sourcing for a common cause, Government or Institutional or Foundation fundings that does not seek any profit maximizing goals. We shall be answerable and accountable to the promised deliverables and reasonable returns but any preemptive strategy from the funder to extract profit from us or using Coopon as scape goat, we must terminate such contracts before hand. If sensed late, we must adopt protocols to terminate for good. Current Full-time or Part-time members can contribute to the financial supply along with their labour contribution whenever they feel comfortable with it. Every payment will be routed to coopon's account, as cobudget, which will then be routed to respective member who works as full-timer for coopon - as they have natural priority as full timer. Bank accounts of individual members will be helpful for other members of Coopon, to be benefeciaries, to credit shared salaries, benefits. Members who would like to take up projects of cooperative, or in the name of cooperative, must have an invoice generated to prove transparent in accountability. This requires a standard document to create invoice for projects that we cover. Such document can be accessed from the meta repository.